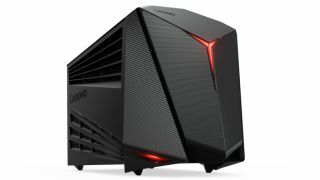 Lenovo has unleashed two new VR-ready gaming PCs which are built with portability in mind, one of them being an all-in-one, and the other a compact desktop computer. The idea is you can experience virtual reality wherever you go, Lenovo says, although 'portable' is a relative term when it comes to PCs compared to laptops – and of course you'll need to lug your VR headset along as well. At any rate, let's start with the desktop model, which is the IdeaCentre Y710 Cube, and as the name would suggest it is indeed a relatively compact cube of a Windows 10 PC that weighs 16 pounds (around 7.25kg) and comes with a carrying handle. As for the spec, you can load this machine with up to a Skylake Core i7 processor, and a GeForce GTX 1080 graphics card, with a maximum of 32GB of system RAM. On the storage front, you can plump for up to a 256GB SSD or a 2TB spinning disk. There's plentiful power on hand to drive VR or 4K gaming, then, and this is backed up with Killer DoubleShot Pro Wi-Fi for a less laggy wireless connection, and a built-in Xbox One wireless receiver that can support no less than eight console controllers simultaneously. Moving on to Lenovo's all-in-one, this is the IdeaCentre AIO Y910 which boasts a 27-inch borderless display with a resolution of 2560 x 1440 – the screen offers an impressive refresh rate of 144Hz, too, and a response time of 5ms. The core components run along exactly the same lines as the aforementioned Y710 Cube PC – so you can have up to a Skylake Core i7 processor, GTX 1080 (or AMD RX 460), 32GB of system memory, and 256GB SSD or 2TB HDD storage. Again, Killer DoubleShot Pro Wi-Fi is on board and you also get a pair of 5W Harman Kardon stereo speakers built-in. Lenovo says the rear panel of the AIO is easily detached to allow access to the main components, so you can upgrade the machine without any fuss at a later date. So, pricing: the VR-ready IdeaCentre Y710 Cube which boasts a GTX 1070 graphics card starts at $1,300 (around £1,000, AU$1,700), with the VR-ready IdeaCentre AIO Y910 also carrying the GTX 1070 pitched at a steeper $1,800 (around £1,380, AU$2,360). Both these models will be available from October.